Time to take another stab at this. This will be my third time at bat. Had an oh so close the first year, a near total fail the second… It’s fun. I am working on talking a friend into the insanity. No luck yet. 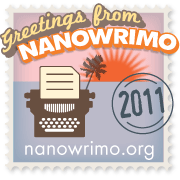 UPDATE: +1 on NANOWRIMO – Waiting for details, but – in a moment of weakness and what can only be described as self inflicted torture – my friend has signed up!